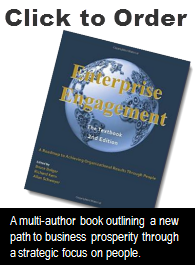 Engagement Strategies has reported on dozens of research studies demonstrating the high financial return of Enterprise Engagement (see The World of Engagement Research or the EEA Engaged Company Stock Index comprised of public companies with high levels of employee and customer engagement). The ECSI continues in its third year to significantly outpace the performance of the S&P 500, as well as 99% of all investment and hedge fund managers. Because the majority of companies have overlooked these economics since the beginning of the Industrial Revolution in the 19th Century, it should be of no surprise that CEOs overlook another hidden cost of some corporate and employee pay policies as well: regulatory and legislative battles over pay. The push for a higher minimum wage isn’t a left-right issue. The one issue uniting many people in both parties is the concept that low wages are subsidized by taxpayers who have to pay for the food stamps and emergency room care and other services for full-time American citizens, let alone illegal immigrants, who are not earning a living wage in many locations. In Great Britain, the conservative government of David Cameron has taken up the cause, insisting that all U.K. companies pay a “living wage.” Of course, the living wage question raises the ancillary question of why executive salaries are so much greater today as a proportion of employee salaries than they were 20 years ago. So what happens, as a result? Public companies will have to collectively spend hundreds of millions or more fighting regulatory and legislative efforts that at the same time undermine their investments in advertising and public relations to promote a positive brand. In a recent regulatory decision, the Securities & Exchange Commission will now force public companies to disclose the specific disparity of CEO versus average employee pay. How much will it cost to comply with that? What surely is next in the current climate is a request in future rulings for more disclosures related to employee benefits and work life policies. Where will it end, a company’s attorneys might ask? In the world of Enterprise Engagement, there would be far fewer such issues, because in this world leaders measure all of the costs of doing business, not just the ones they have to report to the S.E.C. or that stand out on profit/loss statements or balance sheets. They understand that the principles of fostering engagement across the organization and communities aren’t actually a cost but are in fact an investment with a sound ROI. As the author Zeynep Ton compellingly argues in her book, The Good Jobs Strategy, people paid enough to meet their needs in an organization that values talent and commitment actually cost less in the long run. These employees stay longer; reduce the high costs of recruitment and related administration and other disruptions; help recruit other talent; better satisfy internal or external customers; are more likely to identify ways to improve performance and quality; or work extra hard because they want to when it can help meet the needs of a customer. Companies can measure these and other benefits if they so choose. There is an equally important and tangible consequence for failure to properly value human capital: the very regulatory and legislative action, demonstrations and negative publicity many corporate titans apparently decry. What is the cost of all of the lawyers, lobbyists, publicists and erosion of brand equity necessary to defend against paying every full-time employee at least a living wage? If every company were run like Whole Foods and Starbucks, would people be clamoring to the same extent for new laws and regulations, or even, for that matter, public disclosures about executive pay? Most Americans don’t mind the idea of an executive becoming rich, but they expect their share as well, since they know they’re doing a lot of the heavy lifting too. Does this seem naïve; that the benefits of paying low wages simply aren’t worth the legal battles and that the policies of people-focused companies actually costs less? Ask yourself this broader question: How many unions would we have ever needed if all companies focused on enterprise engagement from the start of the Industrial Revolution? What did early capitalists gain protecting their freedom to pay any wages to people of any age in any work conditions they wanted? The cost of unionization and regulations that resulted is probably incalculable compared with the benefits of paying people a living wage in safe work conditions designed to foster proactive involvement in success. The trouble with leaving pay policies to legislators is that it’s naïve to think a company can simply pay more and everyone will become more engaged and work harder so that costs go down. No. That’s why we call this Enterprise Engagement – it takes sound and caring management and understanding of all engagement principles to create a win-win of well-paid employees, management and investors, and no amount of regulations will change that. John D. Rockefeller, often characterized as a ruthless robber baron who built his wealth on brutal anti-competitive practices, always paid his employees well above the norm, was known to have fostered long-term loyalty, and never had any significant labor strife or unions at companies that he directly managed.